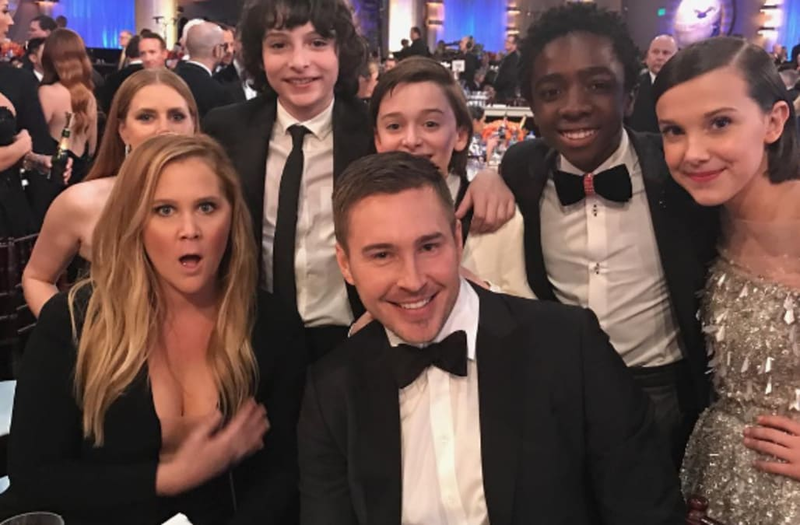 Our favorite part about the Golden Globes this week were the behind-the-scenes snaps that all of our favorite celebrities shared on Instagram on the night of the show! As much as we love watching celebs accept their much-deserved awards, we love seeing them have some fun with each other during the commercial breaks and inside the exclusive after parties even more. Amy Adams hilariously photobombed Amy Schumer's photo with the "Stranger Things" kids, while Kendall and Kylie Jenner posed together inside one of the after parties in their glam looks. Drew Barrymore and Kristen Wiig snapped a gorgeous black and white selfie while enjoying the festivities, too! But, contrary to popular belief, the Golden Globes wasn't the only thing to happen this week. Britney Spears shared a cheeky selfie in bed with her new man, Sam Asghari, while Miley Cyrus took a pic with two of her adorable dogs. Also notable this week? Selena Gomez and Kim Kardashian, who had both been relatively (or, in Kim's case, completely) silent on social media recently, made their triumphant returns to social media with more than a couple photos to quench our thirst. And here I am casually sniffing my knuckles.